Hope that you had fabulous holidays. Today is a pretty easy post that I hope that you’ll enjoy. 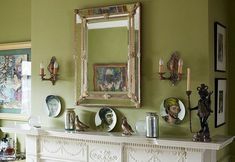 It’s all about something called an Enfilade. For those that don’t know what it is, it’s when the doors all line up to create a passage that goes from room to room. What differentiates it from a hallway, is that there is an actual door or doorway. There can be rooms on both sides or just one side. Enfilades have been around for centuries and as far as I know began in Europe but that might not be true. You can read more about them here. They were commonplace in castles and grand homes, especially in England and France. Enfilades lead one from the living areas to the bedroom and yes, the bedroom was open. You might say it was the “open concept” of the 18th century. The higher your stature or connection to the homeowner, the further in you were allowed. Folks weren’t as hung up on privacy as we are. That started later, maybe in the 1800s. But I also think that there were practical reasons for the enfilade. Do architects still make use of the enfilade? Absolutely! And we will see that later on. But besides residential use, the system of the enfilade is very popular for museums as it facilitates movement of large numbers of people. The enfilade as we will see goes from very plain to very ornate. Let’s take a look at some enfilades. The grand daddy of all enfilades is probably this marble clad wonder at Versailles. There is info about the book in the link. Chatsworth has been home of the Cavendish family since the 1550s. Very interesting and tons of info in the link above. rather plain and austere but I love that scrubbed look. Whoa, that might be a little TOO decayed, even for me. But the potential is there. Well, isn’t that another French beauty! Is that mural exquisite or what? Now, let’s begin to explore the enfilade of more modern times. 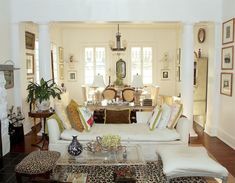 An enfilade in Sheila Bridges landmark Harlem Home! Well, I’ve been saving this one! You might recognize the home as the Bronxville home of a lovely family of six that loves to entertain. Because I noticed right away that they have a three door enfilade which I don’t commonly see. Wallpaper from Cole and Son. By the way, I just happen to have a before shot. Or rather, in progress shot. I took this from the entrance hall, not dining room, obviously. You can find the source if you click here. You might also find an enfilade in a garden if you’re lucky! From My trip to England. The exquisite Laskett Gardens! An enfilade of garden doorways at Tuinzondernaam the gardens of Frank Thuyls and his late partner Pierre van Kol. Via JennyRoseInnes on instagram. And via Henhurst (Phyllis Higgerson) on Instagram. An enfilade, a breezeway and in the far distance an aqua loggia. All related. So incredibly beautiful! And I could keep going. There are a lot of fabulous enfilades out there, but many of the images are not even close to being up to snuff, so they didn’t make the cut. Now, I realize that I haven’t said anything about painting on wallpapering or rules of thumb. But please feel free to ask away in the comments! PS: Don’t forget to check out the hot sales pages if that interests you. Thank you so much Maura. Oh man. have to out today and feeling nauseous at the thought. Hello Laurel, Enfilades can be dramatic, but I would not want to include bedrooms along the line, even for the terminal chamber (if I were inside sleeping, I would get the uneasy feeling that people were staring at my door! I once looked at a house to buy in Ohio that had all five bedrooms on the second floor in a ring-type enfilade–no striking vistas, just inconvenience. The only bathroom was set into the largest bedroom, not part of the enfilade, but the walls were only partial height, as in a public restroom. However, the museum-quality Greek Revival woodwork on the facade and in the double parlors would bring tears to your eyes, it was so beautiful. I thought the same thing as Gemma. An enfilade sounds much more glamorous than shotgun house. Wish I had known at the time!! Wow, do you find gorgeous photos!! BTW, I DO have ads. But this ad network is less than two weeks old. Re: the fan. One of my issues is the state my apartment is in. In fact, right now after it started raining in my bathroom last night, I have guys here ripping it apart and yep. black mold everywhere. And it’s in the kitchen too, I’m sure since there’s water damage there as well. Gorgeous. Gorgeous. So much to explore. 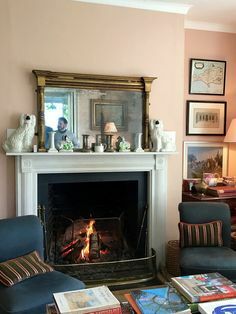 The Bronxville house is lovely. How great that the architect incorporated enfillade into the floor plan. Effortlessly graceful and “gracious” design. You designed and decorated it beautifully. Well, now we’re getting into a hugely extensive subject as we’re talking color schemes. You could purchase my nearly 500 page curated Benjamin Moore paint/palette collection which spells it all out as well as 40 palettes using all 144 colors and much more. The info is here. But one thing that works for me is a jumping off point. It could be a fabric, rug or art. Something like that. Or even an inspiration room/house. And then mixing like colors (analogous) or opposites, sometimes work nicely. Or a neutral scheme with pops of color. And neutral could be whites and creams or beiges or grays. Yummy. I did not know the name for this or that it was a thing, but have been designing a cottage garden with this in mind. Such a fabulous way to lead the eye. I’ve got a mind to add french doors in the dining room going to the kitchen and out back. I just need the doors!